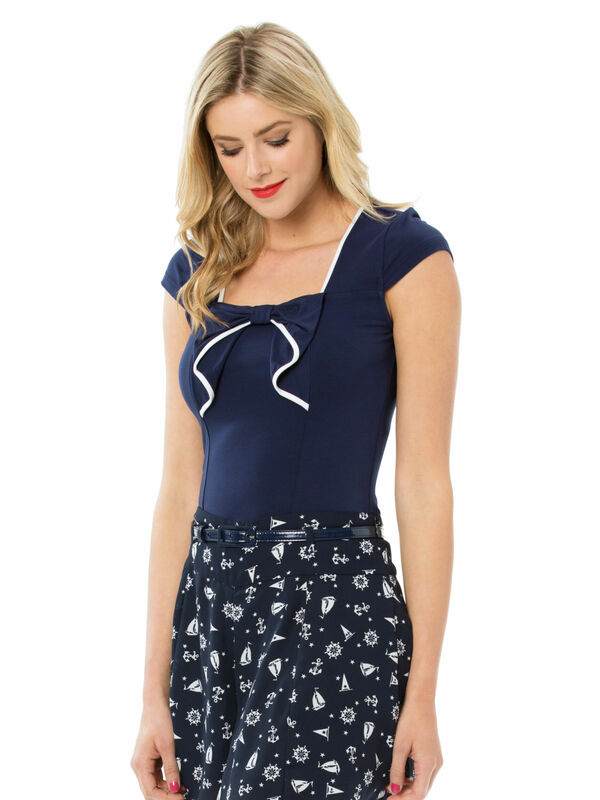 Marcellina Top https://www.review-australia.com/asia/marcellina-top-navy-white/RE19TK001.RENVY009.html For modern style with a flash of vintage flair, don't look past the Marcellina Top in stretch viscose jersey. Beautifully soft and easy to wear, this sweet cap sleeve style is a regualr fit featuring contrast piping, a centre twist bow and seam detailing that elongates the body. Pair with our capri pants or a full skirt to complete the day-to-night look. Worn with the Starboard Shorts and Minnie Heels. For modern style with a flash of vintage flair, don't look past the Marcellina Top in stretch viscose jersey. Beautifully soft and easy to wear, this sweet cap sleeve style is a regualr fit featuring contrast piping, a centre twist bow and seam detailing that elongates the body. Pair with our capri pants or a full skirt to complete the day-to-night look.